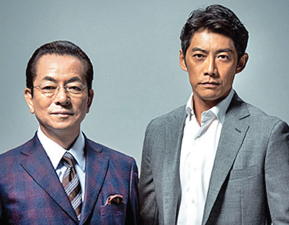 The crime drama “Aibou: Tokyo Detective Duo 17” moves to KXLA Channel 44 on March 31. Beginning next month, Japan Hollywood Network will change its broadcasting station from KSCI Channel 18 to KXLA Channel 44.1. JHN, which airs Japanese-language programming throughout Los Angeles and Orange counties, will move its free broadcasts to KXLA starting at 6:30 p.m. on Sunday, March 31. For nearly a year, JHN has been broadcasting on Channel 18, taking over after longtime station UTB folded its operations. Due to viewer requests, JHN has decided to move its programming to Channel 44.1, joining Kempo TV’s lineup of shows and expanding the Japanese offerings on Sundays. JHN will end its broadcasting on Channel 18 on March 24. Every Sunday, the Japanese broadcasts on KXLA will begin with “Kempo TV,” and will include “Bananaman’s Gotcha Gourmet!” and “SoCal Japan”/public announcements (with English subtitles). At 7 p.m., the popular police drama “Aibou: Tokyo Detective Duo 17” returns with subtitles. The broadcasts are free over the air, and can be received with an antenna, either indoors or on the rooftop. For cable or satellite subscribers, Channel 44 is included in most local providers’ lineups. For more details about cable listings, visit www.kxlatv.com. More details about JHN can be found at www.jhollywoodnet.com.